French-door refrigerators have exploded in popularity over the last decade. Because of their rise in popularity, French-door refrigerators are now available in many sizes, colors, and door options. One option that is fairly new to the market is the LG LMXS30776D, otherwise known as the LG 30-cubic-foot French-Door Refrigerator. This article will provide an in-depth review of the LG LMXS30776D fridge, including its features, specifications, pros and cons, price ranges, and comparison to competing refrigerator brands. LG’s LMXS30776D is a stylish, avant-garde refrigerator featuring the company’s PrintProof™ fingerprint and smudge-resistant finish, a Door-In-Door® feature that allows for extra storage and easy access to frequently-consumed beverages and snacks, and a CustomChill® drawer with adjustable dividers and four temperature settings. This fridge also features Smart Cooling® Plus technology, which is designed to maintain optimal temperatures while regulating humidity levels and ventilation. There’s also a sliding Glass N’ Access® shelf that can easily be pulled out for easier access to hard-to-reach foods. Refrigerator Capacity: 17.10 cu. ft.
Freezer Capacity: 8.80 cu. ft.
CustomChill® Drawer Capacity: 3.80 cu. ft. The LG LMXS30776D refrigerator is a relatively pricey appliance. 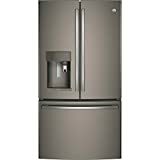 However, the LG website has a promotional deal for this appliance that allows customers to buy it for $3,500 and the refrigerator can also be purchased at Lowe’s, Best Buy, Home Depot, AJ Madison, and Sears Outlet for slightly cheaper. These stores have it available for about $3,000 on average. The LG LMXS30776D comes from a highly popular line of appliances and electronics, but the LG brand still stands against some pretty tough competition. There are several big-name appliance brands out there today that make comparable refrigerators, so we took a look at three of the other top contenders in the refrigeration world. This Maytag refrigerator is popular due in part to its PowerCold® feature, which is designed to keep everything in your system as cold as it was at the grocery store, even after a car trip from the store to your home. There’s also a temperature-controlled deli drawer, perfect for storing meats and other deli items at the ideal temperature possible. The manufacturer’s suggested retail price for the Maytag refrigerator is $2,299, but it can be purchased at Home Depot, Best Buy, AJ Madison, and Lowe’s for less than $1,900 on average. This means the LG option is nearly twice as much as the Maytag MFI2570FE model, so getting this Maytag appliance could be a safe bet if you’re looking to save money. Most customers report that the Maytag is incredibly easy to use due to the sheer size of the unit. People love that food never goes bad due to being hidden behind other food items in a cramped refrigeration space. The high ease-of-use rating is also attributed to the adjustable and removable shelves that make for easy storage of nearly any-sized food item. Depending on where or how the refrigerator is purchased, assembly and installation time for the Maytag is usually a smooth, straightforward process. There is usually no assembly required by the customer, making assembly time a non-issue. A surprising number of users reported problems with leaks from underneath the device, which often led to ruined kitchen floors. Because of the common occurrence of this issue, we had to knock a star off the build quality rating. This Maytag fridge features a one-year limited warranty for parts and labor, followed by a second through tenth-year limited warrant for the compressor, which doesn’t include labor. This is slightly less ideal than LG’s warranty, which includes a five-year parts and labor warranty for the compressor and the sealed system, as well as a 10-year parts warranty for the linear compressor. The manufacturer’s suggested retail price for this GE model is $3,299, but it can be found at Lowe’s, Home Depot, Best Buy, Appliances Connection, Sears, Goedecker’s, and other appliance stores for price ranges between $2,500 and $3,000. Like Maytag, this option is also a lot cheaper than the LG unit starring in this review, making it a good option for budget-conscious buyers. he layout of the GE refrigerator is simple enough for just about everyone. There’s even a hot water scheduling feature that allows for having hot water ready for you as soon as you need it. The drawer setup in the unit’s interior makes for supreme organization, so your food will never get lost in the chaos of an overcrowded appliance. Depending on where the buyer chooses to purchase this GE model, assembly and installation time is normally a smooth and straightforward process. Delivery and setup of the device typically takes about an hour, so there’s usually no need to cancel a whole day’s worth of plans. No assembly is required by the customer, so assembly time is generally not a concern for buyers. Although most users love the unique addition of a Keurig® coffee machine right inside the fridge, some have reported issues with the control panel shorting out in an untimely fashion. However, the majority of users believe this fridge to be of a high-quality build with enough space to hold exceptional amounts of food. Unlike LG or Maytag warranties, the GE appliance comes with a limited one-year warranty on the entire appliance and a limited five-year warranty on the sealed refrigeration system. This warranty applies to both parts and labor. It’s not as great as LG’s warranty offering, but it’s not the worst warranty we’ve seen for a refrigerator either. The Whirlpool WRX735SDH refrigerator features a refrigerated exterior door that can hold a surprising amount of food items, adjustable gallon-door bins that allow for maximum storage ability, and an exterior ice and water dispenser that allows users to get a cool, refreshing drink without having to open the door. 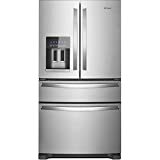 With a manufacturer-suggested retail price of $2,399, the Whirlpool refrigerator is much cheaper than the LG option but in the same price category as the GE and Maytag appliances. You can also purchase it at Home Depot, Best Buy, AJ Madison, Costco, and other appliance stores for about $1,800 on average. Most users report that setting the desired temperatures and using the fridge’s extra features is relatively easy. The size of the Whirlpool unit makes for user-friendliness, and customers love being able to store so much food with such ease. Depending on where and how the buyer chooses to purchase a Whirlpool appliance, assembly and installation time is usually one of the easiest parts of the purchasing process. No assembly is required by the customer, so assembly time isn’t much of a factor when it comes to these refrigerators. At first glance, the Whirlpool gives off the impression of a well-made product. Its outer appearance is sleek and stylish, making it an ideal addition to virtually every kitchen. However, because of issues with a flawed icemaker design and freezer temperature ranges, we couldn’t give it a perfect build quality rating. The Whirlpool refrigerator has the least appealing warranty offering with just one year offered for both parts and labor. Although it is nicely built and easy to use, customers may be taking a gamble when purchasing a Whirlpool of this size and caliber. This means the LG refrigerator has the best warranty offering in our review. This LG refrigerator is quite an impressive appliance, but it still doesn’t come without relative imperfections. After all, no appliance has been made perfect as of yet. We gathered data from hundreds of customer reviews and came up with our own list of positives and negatives regarding the LG LMXS30776D. well-designed icemaker and the low level of noise it produces. The LG LMXS30776D refrigerator is a sleek and well-designed piece of equipment. The brand’s customer service team may not always be the most helpful according to many customers, but it’s hard to argue with the fact that LG makes high-quality electronics and appliances. Users who enjoy entertaining will love the amount of storage space available for party food and other perishables, and those who love organization and efficiency will enjoy the interior layout. Although the LG LMXS30776D refrigerator is relatively expensive, people who choose to buy it will more than likely see the benefits for years to come. Users who enjoy entertaining will love the amount of storage space available for party food and other perishables, and those who love organization and efficiency will enjoy the interior layout. Although the LG LMXS30776D refrigerator is relatively expensive.